Tigre Bradley is a thinker, especially when it came to his marriage proposal for Galion native Maggie Smith. 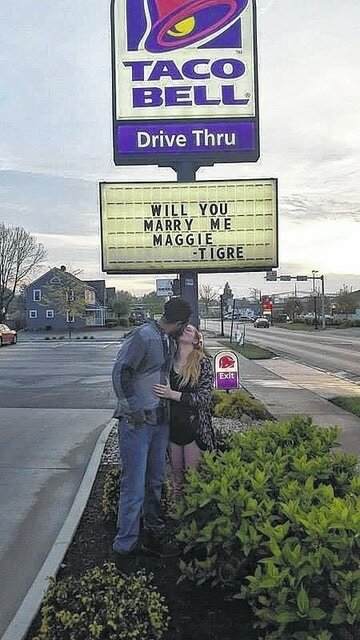 The Mansfield native reached out to about 10 fast food places Wednesday to have their signs say, “Will you Marry me Maggie.” About five of them agreed to do it. The story of how the two met was like a princess fairy tale, Bradley said. The couple met about seven years ago, where he and Smith’s father lived. He and his friend walked to the park where he first laid eyes on Smith. After five years, he reached out to her on social media and they “picked up right where we left off,” Bradley said. The couple has now been together for two years in September. After the surprise proposal, Bradley took Smith to a restaurant where he got on one knee to complete his romantic request. Smith has two daughters of her own: Keeley Koge, 6, and Myla Harvey, 3. The newly engaged couple are also expecting their own child in December. “I didn’t believe in love at first but with her I know that it’s possible,” Bradley said. Galion’s Maggie Smith, left, gets a surprise proposal from her sweetheart, Tigre Bradley of Mansfield, by having fast food eateries put “Will You Marry Me Maggie” on their signs on May 11.